Do you ever step out of the shower and catch a glimpse of yourself in the mirror? What’s the first thought that goes through your mind? Gotta confess, mine isn’t pretty. When I was little, I was “chubby”. Sometimes, I still look in the mirror and see that little girl. Other times, I notice my thoughts and try and be a little kinder. I have found when I notice my world, that which I need to learn shows up pretty clearly in front of me. As life would have it, my learning of physical self-compassion came in the form of two videos seen on the same day. The first video was directed by documentary filmmaker Cynthia Wade and produced by our (wildly talented cousin) Sharon Liese (Producer, High School Confidential) and debuted at the 2014 Sundance Film Festival a few weeks ago – to high praise and well deserved acclaim. The 7-minute short film called Selfie explores how social media is shaping the way we perceive beauty and follows a series of teenagers and their mothers who are asked to take self-images that highlight their insecurities about the way they look. The film aims to empower women to redefine the traditional perception of beauty found in glossy magazines and movies. The second video, Pro Infirmis (Because Who Among Us Is Perfect?) was shown in my Kabbalah class (www.thekabbalahexperience.com) and shows the creation of mannequins in the shape of body different people. It was so powerful it brought tears to my eyes. As I watch my own teenage daughter grow and move through her self definition and perceptions, I am in awe and constant prayer. How do I help her make sense of all of this when my husband’s Sports Illustrated Swimsuit Issue arrives, blaring three young girls wearing only bikini bottoms and their tushies hanging out? Thankfully, she is bright, emotionally intelligent and has her own sense of (delightful and creative) style. Still, I just read an article in this week’s NYTs that said “It’s been estimated that girls 11 to 14 are subjected to some 500 advertisements a day”. The ensuing results could fill 10 posts. Why aren’t we seeing more videos like Selfie and the Mannequins? Afterall, if we really are trying to accept ourselves, may be the Selves we promote should be real – not airbrushed. How do you MindFULLY notice and accept your Self? Let us know! I don’t know if it’s my age, but a lot of loss is starting to show up and it begs the question, “How do WE show up?” Before we can be of comfort, it seems to me that we must first seek to understand what someone is going through. And when it comes to be our turn, which sadly, it will, perhaps we will find solace in the stories of those that have come before us. 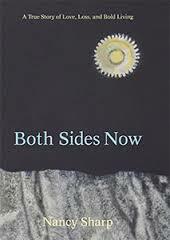 This Wednesday night, my friend, Nancy Sharp, is going to be launching her new book, BOTH SIDES NOW: A True Story of Love, Loss, and Bold Living. Because I can’t write half as well as she can, I am re-printing a piece of the story that has been written and shared. She is pure inspiration. With grace and dignity and a laugh that makes you smile, Nancy shows us all how to live BOLDLY. Check out her website for more info on her book and this week’s celebration for those who live in Denver (Tattered Cover, Wed 7:30pm) http://www.nancysharp.net. The past is simply part of our story; just not the whole story…On the very day that Nancy Sharp delivered premature twins, she learned that her husband’s brain cancer returned after eighteen months in remission. Less than three years later, at the age of 37, she became a widow. Seeking a fresh start in the solace of the Rocky Mountains, Nancy packed up her five year-old twins and left Manhattan for Denver, never imagining that she would find love in the pages of a magazine. But after reading an article on eligible bachelors, Nancy sent an email to Steve Saunders, a popular Denver television anchor turned political candidate as well as a widower who’d lost his wife to cancer, and was raising two sons a decade older than Nancy’s twins. Together they started a new chapter of their own. In BOTH SIDES NOW Nancy shares her unforgettable journey – one that offers enlightened understanding for living life to the fullest. Her story is a gift to those looking to lift themselves from the embers of loss and adversity through bold living. 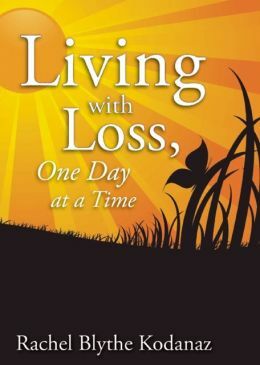 Also on our shelves, we are blessed to have another friend’s book, Living with Loss, One Day at a Time. While it, too, was born out of the passing of her husband, Rachel Blythe Kodanaz takes her bountiful compassion and understanding and shines a daily light for those who may be taking it, “one day at a time”. The 365 daily lessons and thought-provoking ideas provide hope, optimism, introspection, and self-discovery. There is no beginning or end to the book – the reader can skip around or dive in sequentially. The book is a great tool to spark communication with your family on a daily basis as each day provides a discussion item for all ages and creates a meaningful dinnertime conversation. The pages provide space for journaling and capturing the reader’s perspective on the topic of the day. The upbeat and matter-of-fact format allows for clarity on subjects that are often overlooked or not discussed amongst friends and family. Whether you recently experienced a loss or find a need for a boost of encouragement, the book will be your companion through your journey. Living life includes living loss. How do you MindFULLY live both ?